I have been thinking a lot about music lately and just how much it plays a part in my daily life. As I sit here typing, I ‘m listening to a selection of piano compositions by Max Richter and feeling a peaceful contentment. I listen to music when I cook, when I get ready in the morning, when I’m feeling down or feeling happy. I think about how we use song to mark special occasions, about how, when a certain song plays, it can evoke a powerful memory. How many of us joke that we can’t remember certain facts about the world but can remember the lyrics to songs we haven’t heard in years? I use song as a vital component in my classroom. Songs are used to mark transitions in the classroom day, to soothe a child who might be feeling sad, singing songs to get the wiggles out and to just celebrate our happiness. There is nothing sweeter than watching a child sing to themselves as they do their work. How can we bring more music into the lives of young children? 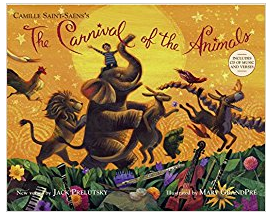 This is a lovely book with a CD accompaniment that introduces an animal on each page with music that reflects the movements and sounds the animal would make. It’s a fun collection that even the youngest child can enjoy. Listen together and glide like a graceful swan or bray like a donkey. 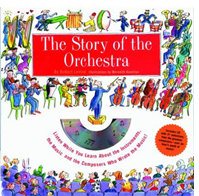 The Story of the Orchestra, by Robert Levine and Meredith Hamilton: More suited for older children (age 5 +), this book and CD provide a wealth of information about composers, musical history and instruments. 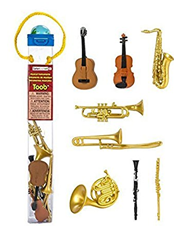 Safari Ltd. Musical Instruments TOOB: These language objects can be found in most craft and hobby stores and are wonderful to keep in a basket on your child’s activity shelf. They can be used in many different ways. Placed in a basket, they can used to introduce new vocabulary to the toddler child. For an older child you can make a matching lesson by putting the objects in a basket with a set of cards to match. (You can make your own set of language cards by taking photos of the objects and mounting them onto plain cardstock). 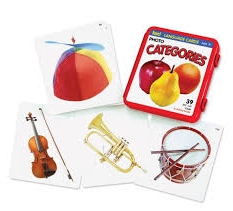 Categories – Hands on photo language learning activity cards: These cards feature musical instruments and more! These are nice single image photos against a white background that can be used in a variety of ways. From memory games, sequencing exercises, group sorting, to simple object identification, these cards offer a wide range of uses. 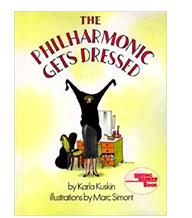 The Philharmonic Gets Dressed, by Karla Kuskin: This book is a favorite in my household! This is a fun peek into the lives of the musicians getting ready to perform a concert. There are fun numbers, clothing styles, methods of transportation and of course – the instruments! Zin! Zin! Zin! 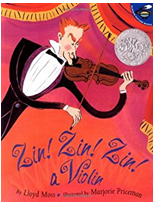 Z Violin, by Lloyd Moss: This book has so many elements that children love. Counting, rhyme, great illustrations and a fun story line that will teach children how an entire orchestra comes together. This same author has two other music related children’s books as well. 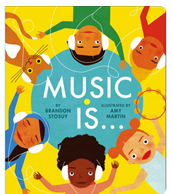 Music Is, by Brandon Stosuy: This sweet little board book is great for younger children to open a conversation on how music makes us feel. Read this story together and then turn on your favorite music and enjoy! 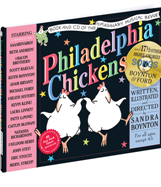 Philadelphia Chickens – A Too Illogical Zoological Musical Revue, by Sandra Boynton: This book/CD duo is just one of Sandra Boynton’s collection of fun-loving songs the whole family can enjoy. They are silly, sweet and funny tunes that you will enjoy as much as your child. My favorite? Faraway Cookies, a song about yummy chocolate chip cookies that are out of reach. You just might find yourself listening to these songs even when the children aren’t around. G’Night Wolfgang, By Ric Louchard: Ric Louchard has made several CD collections for children (G’Morning Johann and Hey Ludwig! are others). These are beautiful classical music collections that are perfect for all ages. The G’Night Wolfgang music features classical selections sure to soothe anyone young and old. 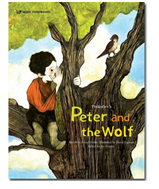 Peter and the Wolf, by Sergei Prokofiev: This classic musical fairy tale is timeless. Great for children ages 5+, this was a favorite of mine when I was a small child. I highly recommend just listening to the tale without the storybook first. It is such a treat for the ears! There are many adaptations of this story but if you can find the audio CD of David Bowie’s rendition, you will love it. Play silks: The play silk featured here comes from Nova Naturals (www.novanatural.com) but there are other retailers that sell play silks. These silks can be used in a variety of ways to inspire imaginative play but they also make a great props for interpretive dance. Play your favorite music, pick up a silk and let the rhythm guide you! What do you and your child love to listen to? Share with us in the comment section below how you bring music into the life of your child. Need a little more Montessori in your life? Sign up today and subscribe to keep up- to- date on great Montessori tips and advice.